The rainbow is a beautiful natural phenomenon; knowing the significance of each of the colors of the rainbow makes it even more beautiful. Rainbow is a beautiful piece of art painted by nature with seven colors beginning with red and ending with violet or purple. VIBGYOR is an acronym for Violet, Indigo, Blue, Green, Yellow, Orange and Red. Redis used in almost every culture to designate warning or danger. Orangerepresents creativity, joy, vibrancy, happiness, playfulness and youth. Yellowis naturally associated with the sun and its life-giving energy, though in a less intense way than orange or red. Green, being the color of both money and nature, may seem to be a bit of a conflicting color also. It is the color of mother earth and nature. The colorBlue invokes a spiritual sentiment. It is non-threatening and depicts security, trust, compassion, stability, patience and mysticism. The colorIndigo implies infinity, mysticism, spiritual attainment and heavenly grace and is in fact the least well known of all the colors of the rainbow. Last, but not the least is Violet, which is a royal color signifying nobility. Purple robes were often worn by royalty and people of authority or high ranks in the ancient times. 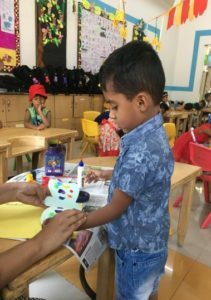 IK-1 Children did a paper activity to better understand the vibrant colours of a rainbow. Teachers gave butterfly cutouts to the students on which they sprinkled rainbow colours and folded the cut outs to smudge the colours and make colourful butterflies. IK-2 A, IK-2 B and IK-2C Cutouts of fish and rainbow were given to the children, which they coloured using bright rainbow shades. 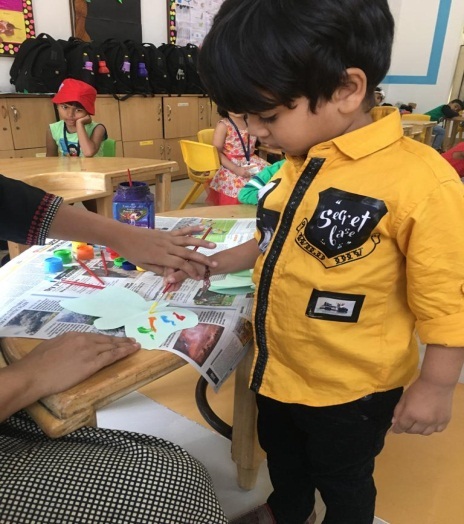 IK-3 A, B & C Another exciting colouring activity was conducted for the students of IK-3 in which children coloured fish cutouts with rainbow colours to make bright and colourful fishes. Children thoroughly enjoyed the art and craft activity. 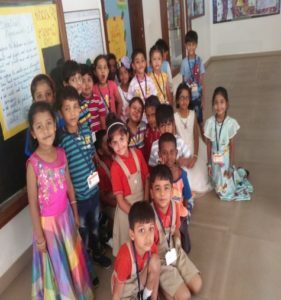 They participated in the colour theme with excitement and fervor.